The Story: In media res! Hawkman joins Batman in an unconscious heap thanks to a giant robot named Glugg! When other JLAers get there, Batman is back on his feet, raving about being King of the World and ordering the giant robot to attack his friends! And Glugg kills them all! But no, it was only JLA robots cleverly substituted by Green Lantern. The real Atom sneaks inside Glugg and disables him. Traveling across the galaxy, GL, Atom, The Flash, and Zatanna find Glugg’s home planet, a ruin where they meet analogues of Marvel’s Avengers (more on this below) who have come to Glugg's planet for much the same reason as the JLA. The two teams have a Misunderstanding Fight that ends after Zatanna shows concern for a fallen foe. The heroes discuss the futility of war, and the issue ends abruptly, quoting the Sermon on the Mount (“Blessed are the peacemakers”). I guess after that, everybody goes home. Note again how stretching out your unclenched hand is said to be a sign of peace, just like last issue. Continuity references: GL’s ring is much less powerful than before “as shown in the cataclysmic events Green Lantern has been experiencing in his own magazine!” Have you noticed that Superman and Batman never get their books plugged? Jack B Quick, the Quicksilver analogue in baby blue, is “not as fast as The Flash,” let the record show! Blue Jay can shrink to bird size, so not as small as The Atom, or even Yellowjacket. Wandjina, the Thor analogue with blue shorts and a red cape, may be named for an aboriginal rain god, but his appearance is more European, with a bald head, flowing blond fur on his costume, and a steel battle-axe. At least he puts the lie to last issue’s claim that aborigines are moral primitives who only know hatred. Silver Sorceress has “Hex Power” like Scarlet Witch, and a similarly face-surrounding headpiece. This is an uncharacteristically mopey Superman, feeling unappreciated and alienated. In all fairness, he is an alien. But no! It’s Green Lantern, Atom and the very married Flash who are snuggling up to Z by the end of the story. Friederich really likes her, talking constantly about her eyes and her smile. She appears quite pleased to be the centerpiece of their group hug. Julius Schwartz grants us readers the ability to understand the language of the Thunderers. That was nice of him! But the JLA can’t understand without the help of Green Lantern’s ring. Friedrich fulfills the “socially conscious” quota for this story with a cautionary tale about nuclear holocaust, working in a dig at those evil corporations in the process. It's also the second issue in a row with a "give peace a chance" theme, and like the Planet Monsan story involves a JLA trip to a barren planet. "Cam-Nam-Lao?" My, whatever could that planet name be alluding to? I remember scavenging a copy of this from the ground or a trash can or someplace in the early 70's, long after it had left the newsstands, and I immediately recognized the Avengers clones. I was not impressed, especially since Friedrich had picked some of the lamest Avengers, in my opinion, to clone. I later managed to work up some fondness for Blue Jay, the analog of what eventually became one of my favorite Marvel characters, but Wandjina was clearly a turkey, and the "Silver Sorceress" (as as since been often pointed out) didn't have a bit of silver to her design. I also didn't twig that they were supposed to be the Avengers. Or that the Extremists were various Marvel villains. I was a bit slow. No, they came from an alien world and met up with the dictator of Biyala, who snowed them into attacking a Soviet base. That's the Eastern Europe connection you are probably thinking of. 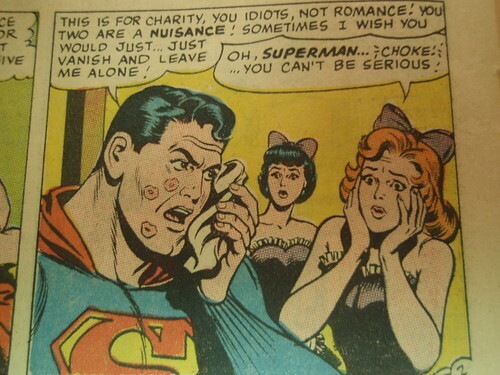 See, all Lois needed was a skimpy tuxedo outfit, fishnets and high heels and Superman would have been hers. The background is in a Deutsch Angle toward the left, but the characters are diagonal to the right. Superman must really be leaning in on her. It's just a weird angle. 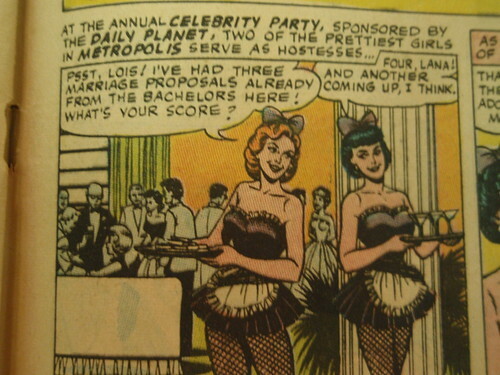 You mean, like in Lois Lane 60 (October 1965)? I first came across the Thunderers during the DeMatteis and Giffen run of Justice League. Their being Avengers stand-ins was a bit disappointing, as they were pretty removed from their models (and weren't even based on most of the "interesting" Avengers)... Silver Sorceress looked more like a rabbit than a sorceress, too (plus she was brown instead of silver). Disappointment was apparently a feature of the team, judging from their introduction in JLA! Fishnets is like kryptonite to straight males, not just Superman. Creative Team: Mike Friedrich wrote it. Art is Dillin and Giella. ...It’s Green Lantern, Atom and the very married Flash who are snuggling up to Z by the end of the story. Friedrich really likes her, talking constantly about her eyes and her smile. She appears quite pleased to be the centerpiece of their group hug. Re Zatanna: IMO Friedrich was just continuing what Gardner Fox had started back in 1967's Justice League of America #51, Z's first JLA appearance (after she'd popped up in various series--see caption in the second panel). I'm betting Clark asked Lois if she still had that outfit, after they got married (Earth 2).